Look east with a beautiful new scent that complements the original citrus-influenced Green Tea fragrance. Green Tea Lotus is an elegant fragrance inspired by the flowers traditionally used to scent teas in India, China and Japan, plus the beautiful lotus blossom. The notes include ume plum, cherry blossom, yuzu, green tea, aglaia, blossoming lotus, white birch and musk. Coming in June from Estee Lauder's Aramis division, Mustang Blue, a follow-up to last year's Mustang fragrance for men. The new fragrance is classified as a fresh fougère, and is said to be sexier than the original. The notes include bergamot, lemon, mint, basil, lavender, geranium, clary sage, clove leaf, cypress, pine, artemisia, cardamom, black pepper, cedar leaf, sandalwood, patchouli, hay and musk. You know, Aramis produces it but I don't think it appears under the Aramis brand name. 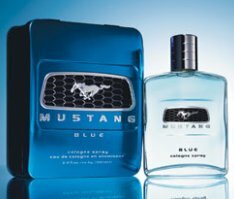 Never paid attention to where the original Mustang scent appeared last year, but would guess more like mass retailers, like Walmart & Target. Green lotus and tea seems like a nice mix, but it will be hard to knock me off from the lotus in Jardin sur Le Nil. A long time ago, I wore Blue Grass by Elizabeth Arden, it was the only thing I could wear while I was pregnant. Sigh, will either of these build memories? Most of the EA Green Teas are so sweet…but admittedly have not tried the last few flankers. Maybe will give this one a shot.